Create a perfect canvas for foundation application with this silky, lightweight blend of vitamins A & E, grape seed extract and green tea. Worn alone or under foundation to increase its longevity, our best-selling primer helps to reduce the appearance of fine lines and pores for flawless skin with a velvety-smooth finish. In a new square airless pump for freshness to the last drop. Use after moisturizer and before foundation for complexion perfection. This skin-soothing blend of antioxidants, which can be worn alone or under foundation, works overtime to fill in fine lines and even out skin texture. My face is extremely sensitive. So I can’t wear foundation, cover up, bronzers, basically… nothing. My face hates me. For my graduation photos I used the traditional cover up and bronzer… well, after three hours, my skin took revenge. It was not happy. Even natural products are not always the best. Anyway, my fellow makeup-obsessed friend Kym is huge on testing out products, especially if they’re popular. We always hit Sephora, and Smash Box was everywhere. I always went to Stila. She purchased the popular primer and I naturally purchased more eyeshadow. Weeks went by and the popularity was growing. 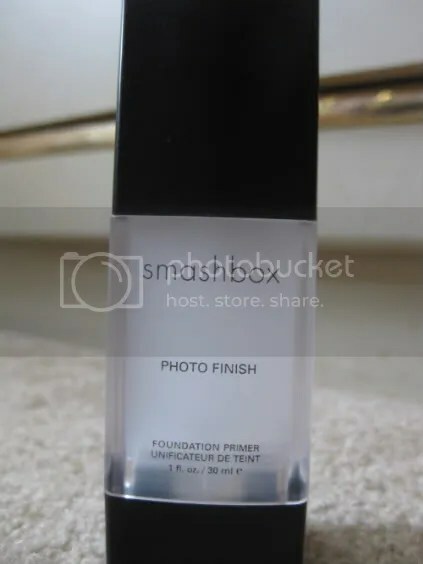 Smash Box was advertising all the awards Photo Finish was winning, and Sephora couldn’t even keep it on the shelves! But for $45+tax? Really? What’s so great about it? I read up on it and it was rare to see a bad review. Basically, it would make your oily skin not-so-oily anymore. Well, I caved. And to this day I regret it. The first time I put it on it felt nice. It wasn’t wet, but it had this silk feeling. My skin felt nice and smooth. It’s like your skin was made of silk. I thought, WE HAVE A WINNER! Well, not too long after my skin was feeling funny, it wasn’t tingling (so I knew the chemicals were okay and wasn’t burning my skin), but something was off. Not much I could do because I was out, and had to wait until I got home. Well I wiped my finger on my cheek and it’s like a slab of sweat came off (gross I know.. but it wasn’t). I took out my mirror and it’s like I went swimming. Well, not to worry, I’m new at this, I obviously put it on wrong. I wiped it off with kleenex, and that was that. Well turns out, I did apply it right (how could I not? It’s not rocket science). Tried it again and the same thing. And again, same thing. Gave up after a few times. This was absolutely the worst product for my face. It did nothing but made my face an oil-machine. It goes on perfectly, but it doesn’t last. So what did I do with a $50 primer? Handed it over to my sister.